NEW YORK -- There's a birthday being celebrated Monday in Brooklyn more than a century in the making. 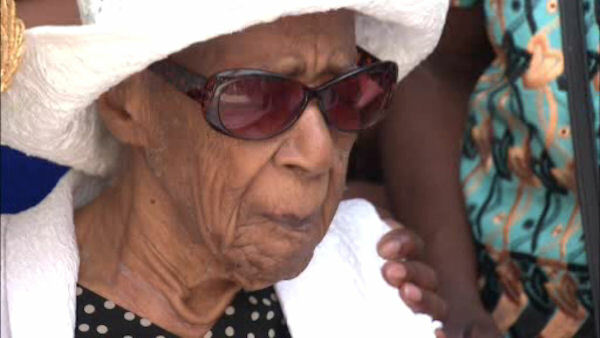 Susannah Mushatt Jones, the world's oldest living person, is turning 116 years old Monday. Jones will celebrate this milestone year with two birthday parties - an intimate family gathering Monday and a larger celebration with her housing community, friends and local officials Tuesday, according to a Guinness World Records press release. Born on July 6, 1899, Ms. Jones became the record holder at the age of 115 years and 346 days as of June 17, according to Guinness. Jones, known as "T," short for auntie, to her 100 nieces and nephews, said the secret to longevity is sleep, Guinness reports. While she's lost her eyesight and has difficulty hearing, she only takes two medications a day and is not bed-bound. She also starts her day with a good breakfast featuring four strips of bacon. When Jones was 106, The New York City Housing Authority paid tribute to her regular participation in community patrols. Former city mayor Michael Bloomberg congratulated her on her longevity and wished her "good health and great happiness." At the time, Jones told the Housing Authority she never drinks or smokes, and surrounds herself with love and positive energy. "That's the key to long life and happiness," she said. The oldest person to have ever lived is Jeanne Calment of France, who lived to 122 years and 164 days. According to Guinness, Jones was born Susie Mushatt in Lowndes County, Alabama, to Mary and Callie Mushatt. Her father was a sharecropper who picked cotton to support his wife and ten children. In 1922, Jones left Alabama for New Jersey before moving to New York City in 1923, finding employment as a live-in housekeeper and childcare provider.